Pizza waffles are sweeping across the food world. Fun, crispy and oozing with cheese, it’s no wonder they’re such a hit. Waffles are one of those foods that seem to go with anything. Surprisingly, many types of foods “waffle” well, including cornbread, hashbrowns, falafel and brownie sundaes. Something about toasting food in a criss-cross pattern makes it even more delicious — and we haven’t even mentioned the toppings. From fresh fruit and ice cream to fried chicken, almost anything goes well with a waffle. Pizza is no exception. Waffle-ized pizzas are an internet phenomenon, and they are popping up in more and more restaurants around the country. In this guide to the pizza waffle trend, we’ll cover the history and varieties of this savory dish, and guide you through making and serving your own waffle pizzas. Pizza waffles are just what they sound like — you take the ingredients in a pizza and toast them in a waffle iron. Typically, waffle pizzas begin with a layer of pizza dough, followed by tomato sauce, toppings and a generous helping of cheese. A final layer of pizza dough is added to the top, and the entire concoction is toasted in a waffle iron. Classic waffle pizzas are a type of waffle calzone, although some variations use a waffle base as a crust and add toppings to the top, closer to a typical pizza. The origin of waffle pizza is hard to pin down. Waffles can trace their history back to ancient Greece — cooks would toast flat cakes of bread between two hot metal plates to make a dish called obelios. Over the years, the concept of roasting dough between two plates evolved, eventually influencing the bread served during services in the Catholic church. These “wafers” gradually became wafels. The distinctive grid pattern appeared in 15th century Denmark, and by the early 18th century, wafels had become waffles. Cultures throughout Europe continued to develop their own unique twists on the recipe. It wasn’t until waffles crossed the sea to America that they became synonymous with breakfast — up until then, waffles were served as a snack between meals or a crispy dessert. Cooks in the United States added maple syrup and turned the dish into a morning staple, but they didn’t stop there. Americans have a knack for experimentation, and our waffles have continued to evolve — as they became easier to make, they changed, and we entered a kind of waffle renaissance. Today, you can find classic waffles topped with whipped cream and fresh-cut strawberries or rich American versions smothered in melted butter and maple syrup. You can order gluten-free waffles, chocolate cake waffles or waffles topped with crispy fried chicken — chicken and waffles are a Southern favorite, and they appear in restaurants around the world. Pizza waffles are just the latest waffle iteration in a long history of innovation. You’re most likely to find them in America’s big cities, but their true success is in home kitchens across the country. Fast, simple and delicious, waffle pizzas are quickly becoming a go-to comfort food. The beauty of pizza waffles is their simplicity. Essentially, all you need to make a pizza waffle is a waffle iron, pizza dough, marinara sauce, cheese and any extra toppings of your choice. Waffle pizzas can be as simple or as complex as you want — if you are an experienced home chef or love to cook, you might want to make your dough and sauce from scratch. 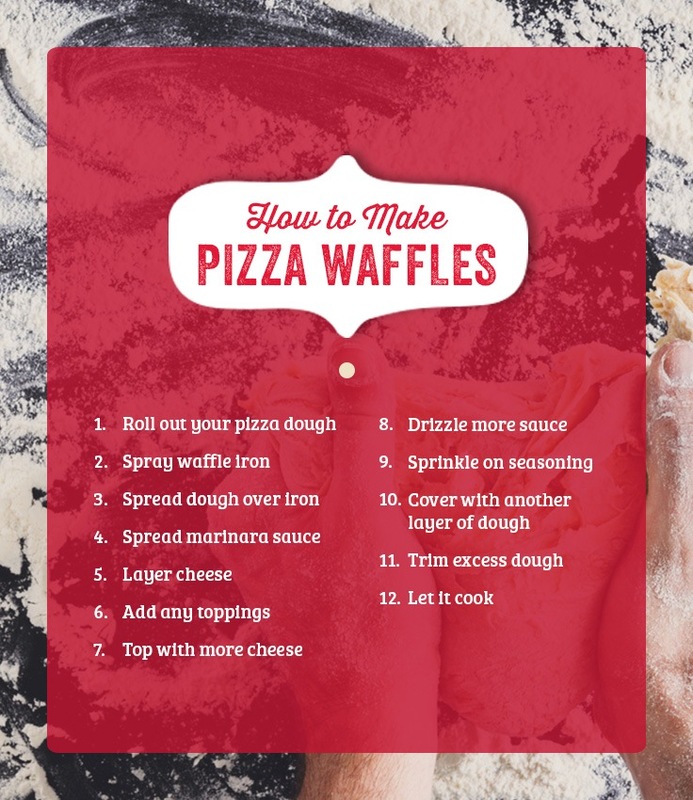 Alternately, you might be looking for a delicious meal to make for guests that doesn’t require much time — if this sounds like your situation, try making waffle pizzas with pre-made dough and sauce instead. Below, we’ve included some basic waffle iron pizza recipes for dough and sauce before walking you through the process of assembling a pizza waffle. If you already have dough and marinara on-hand, feel free to skip to part three to start making your waffle masterpiece. A pizza is only as good as its dough. The same rule applies to waffle pizzas — to make a delicious, crispy waffle pizza, you need a great dough. Here is a basic pizza dough recipe to get you started. Once you’ve gathered your ingredients, you’re ready to make your dough. For detailed steps, check out the complete recipe by chef Bobby Flay. Combine your dry ingredients in the bowl of a stand mixer. As the mixer combines the dry ingredients, pour in the warm water and 2 tablespoons of olive oil. Continue to beat the mixture until the dough sticks together, forming a ball shape. Transfer the dough onto a surface with a light layer of flour. Knead the dough until it forms a smooth ball. Use the remaining 2 teaspoons of olive oil to grease a large bowl. Cover the bowl and set it aside to let the dough rise. After the dough has doubled in size, divide it by half. Let each half rest for about 10 minutes, and then the dough is ready for baking. Many pizza dough recipes make enough dough for one or two large pizzas. Since a waffle pizza is smaller than a typical pie, you will have to adjust your recipe accordingly. Alternately, you could make a large batch of dough and use it to make multiple waffles — it’s up to you. You don’t have to make your own dough from scratch. For a faster pizza dough substitute, you can use refrigerated biscuits as the base of your waffle pizza. Everyone has their own opinion about pizza sauce. Some people prefer a thin smear of sauce on their pies, while others love a thick layer of marinara bursting with flavor. For some pizza lovers, the perfect sauce is sweet and light — for some, a spicy and tangy sauce is the way to go. When you are making waffle pizzas, pick a sauce that you love — whether that means making your own in your kitchen or buying a bottle of pre-made marinara at the supermarket. If you love to make things yourself, here is a basic pizza sauce recipe you can prepare in your kitchen. After you’ve collected your ingredients and have them ready in the kitchen, you can begin making your sauce. For detailed instructions, read the full recipe on Genius Kitchen. Combine all ingredients in a 2-quart saucepan. Reduce heat to low and let the mixture simmer for 10 minutes. Let the mixture cool before spreading on dough. Just like with dough, pizza sauce recipes are intended for full-sized pies. Adjust your ingredients for a smaller recipe, or use a large batch of sauce to make several waffle pizzas. Customize your sauce to match your preferences. For example, if you are making waffle pizzas for kids who love sweet pizza sauces, add sugar to your sauce for a touch of sweetness. Alternately, if you prefer spicy dishes, experiment by adding some crushed pepper flakes to the sauce for an extra kick. Add salt or olive oil for a classic taste, and consider using fresh, whole tomatoes instead of tomato paste for a truly authentic recipe. If you don’t have the time to make your own sauce from scratch, you can substitute your favorite pre-made sauce from the grocery store. Once you’ve made or bought your pizza dough and sauce, you’re ready to begin making your waffle pizzas. Besides a waffle iron, you’ll need a few additional ingredients to get started. After you’ve gathered your ingredients in your kitchen, plug in your waffle iron and get started. Roll out your pizza dough: Using your hands, a bottle or a rolling pin, roll out the dough into flat patties roughly the size of your waffle iron. Spray waffle iron: Spray the waffle iron with a non-stick cooking spray. This will keep the waffle pizza from cooking onto the iron. Spread dough over iron: Lay one circle of dough on the waffle iron, and make sure that it isn’t bigger than the iron’s surface. Spread marinara sauce: Add marinara sauce to the dough. One tablespoon is a good place to begin, but feel free to vary the amount based on the size of your waffle maker and your personal flavor preference. Layer cheese: Layer cheese on top of the sauce — start with around 1/2 cup of cheese, but feel free to add more if you want an extra-cheesy waffle. Thick slices of mozzarella are a perfect choice for this first layer of cheese. Add any toppings: Because a waffle pizza is smaller than a typical pizza, your topping options are somewhat limited. Common toppings include slices of pepperoni and sautéed vegetables. Top with more cheese: Once you’ve layered your toppings, add shredded cheese like parmesan over the top of your pizza. Drizzle more sauce: Drizzle more marinara sauce over the pizza. You only need a little sauce at this stage — too much could overwhelm the other flavors in the waffle. Sprinkle on seasoning: Add any seasonings you want to the pizza — flakes of basil, thyme or garlic are common choices. Cover with another layer of dough: Seal your waffle pizza with a second layer of dough. Fold the bottom edge over the top and press down to seal. Trim excess dough: Once you clamp down the waffle maker, trim away any excess dough exposed around the edges of the iron. Let it cook: Let your waffle pizza toast for five to seven minutes — you want the final product to be crispy but not burned or tough. Once the waffle pizza has cooked, transfer it to a plate. Add any additional cheese or toppings and serve while still warm. Another way to make waffle pizza is to simply toast pizza dough in a waffle iron and then add sauce and seasonings like you would with a regular pizza. In this version, the waffle becomes the crust of the pizza — it is less a pizza-filled waffle, and more of a pizza-topped waffle. Experiment with both versions to find the one you like best. Waffle pizzas don’t have to be a single-serving meal. They make excellent party dishes — it’s unlikely your guests will have experienced the novelty of a pizza in waffle form. If you are preparing pizza waffles for a party, try making them mini — you can stuff biscuits with marinara sauce, cheese and toppings for miniature and delicious waffle pizzas. These smaller waffles easier to eat and serve, and they make excellent appetizers for almost any occasion. Waffle pizzas are especially popular at events that are filled with hand-held foods, like Superbowl viewings or children’s birthday parties. You can also experiment with leaner versions of pizza waffles for a reduced-calorie version of the dish. Substitute gluten-free dough or cashew cheese for an allergy-friendly version of the recipe. Try serving waffle pizzas with a side of green or Caesar salad — the light, fresh salad will help balance the waffles. Waffle pizzas are as versatile as traditional pies. Try different sauces and toppings to make a waffle-version of your favorite pizza flavor, such as pesto chicken, Hawaiian pineapple or buffalo chicken. The only limit is your imagination — experiment with different cheeses and seasonings to create your own signature waffle pizza flavor. Consider making some dessert waffles as a finishing touch to your meal. Top regular waffles with chocolate sauce, ice cream or fresh fruit for a sweet take on the dish, or use a brownie or cake-base instead of regular waffle dough for an even sweeter taste. Pizza waffles are a fun take on the classic recipe. But if you find yourself craving a traditional pie, you can’t get any better than Giordano’s. At Giordano’s, we care about pizza. Our signature recipe began in Italy and was handed down through the generations until Joseph and Efran Boglio opened Giordano’s in 1974. Unlike other “deep-dish” pizzas, our famous pies feature a signature stuffed recipe — a perfectly flaky crust is loaded with a thick layer of toppings, smothered in cheese, covered with another thin layer of crust and finally topped with our classic sauce. If you aren’t near one of our locations, don’t worry — we want everyone to be able to enjoy Giordano’s pies, so we ship our pizzas across the United States. The next time you’re looking for authentic, deep-dish pizza, visit Giordano’s to satisfy your cravings.